First temporal lobectomy, with Dr. David Steven, a neurosurgeon, observing at the Instituto de Ciencias Neurologicas in 2012. In 2008, a collaborative effort between Peru and Canada was born. The purpose of this collaboration was to establish epilepsy surgery centers in Peru. The catalyst for this endeavor was the North American Commission of the International League Against Epilepsy (ILAE) Partnership of Epilepsy Centers across the Americas (PECA) Program. This program funded initiatives to improve epilepsy care in Latin America through partnerships with North American epilepsy centers. 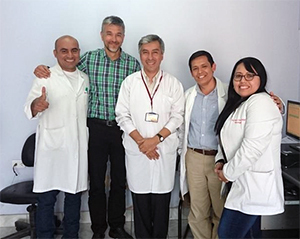 Our partnership with Peru has had the main objective of establishing epilepsy surgery programs in Peru. 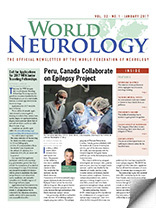 The epilepsy program at Western University in London, Canada, partnered initially with the Instituto de Ciencias Neurologicas (INCN), part of the Peruvian Ministry of Health, and subsequently with the Hospital Edgardo Rebagliati Marins (HERM), part of the Essalud system, both located in Lima. The country of Peru has adequate neurological care in major cities, particularly in Lima. Peru has two major health systems: a public one, funded by the Ministry of Health, and the Social Security System (or Essalud), funded by major private employers. However, certain subspecialized care, such as epilepsy, is lacking. Despite access to most first-, second- and even third-generation antiepileptic drugs, epilepsy surgery was not previously available. 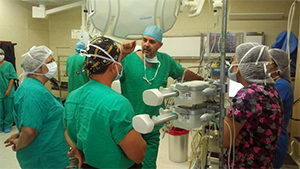 Dr. Miguel Arango, a neuro-anesthesiologist, with one of the Peruvian teams during an awake craniotomy in 2016. The initial partnership with the INCN, which began in 2008, has allowed the establishment of a comprehensive epilepsy surgery program1. 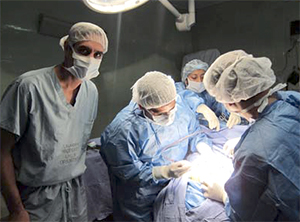 Since 2012, when the first temporal lobectomy was performed, the team has completed 56 more epilepsy surgeries. The INCN has a single bed with video-EEG capabilities that has allowed the evaluation of more than 100 patients since opening in 2009. The partnership began with an initial video-EEG workshop run by the team from Canada, and over the years, it has consisted of annual visits to deliver lectures through symposia and grand rounds, as well as discussion of cases in person and on-line. This also has been carried out with rotations of Peruvian colleagues in the Epilepsy Monitoring Unit in London, Canada. Furthermore, a fellowship in epilepsy surgery was undertaken in Mexico by Dr. Carlos M. Vazquez, and a fellowship in epileptology was undertaken in Brazil by Dr. Jose C. Delgado. The Canadian team also participated in different types of epilepsy surgeries, from the first temporal lobectomy in 2012, to the latest surgery in 2016, which involved an awake operation for mapping of language function prior to a dominant temporal lobectomy. The team used the Canadian model of presurgical assessment and molded it based on the Peruvian reality. The Instituto de Ciencias Neurologicas team. The partnership with HERM started in 2010 when Dr. Alicia Becerra, a neurosurgeon, came to London, Canada, to undertake an epilepsy surgery fellowship. This coincided with the visits of the neurologists Dr. Elliot Barreto and Dr. Mirla Villafuerte to our center as well. Despite the lack of initial support from their institution, they were able to perform three pre-surgical assessments that culminated in successful epilepsy surgeries before 2016. This year, however, their institution has been able to open its own single-bed epilepsy monitoring unit, and it has already been able to perform an awake surgery during a dominant temporal lobectomy. Even though the initial funding came from PECA, subsequent funding came from Western University and private Canadian donations. The collaborations have not ended. More trips to Peru and the future training of an anesthesiologist in neuro-anesthesia are planned for the near future. It is finally our hope to use this model to establish epilepsy surgery centers in other parts of Peru and South America. 1Burneo JG, Delgado JC, Steven DA, et al. A collaborative effort to establish a comprehensive epilepsy program in Peru. Epilepsy Behav 2013;26:96-9. Jorge G. Burneo, MD, is an epileptologist; David A. Steven, MD, is an epilepsy surgeon; and Miguel Arango, MD, is a neuro-anesthesiologist, all at the Western University, London, Ontario, Canada.